Pulsin' Pea Protein Powder is a versatile protein powder made from yellow split peas, with no added nasties! This product is natural, unflavoured and additive free, giving you the freedom to develop your own recipes. It's the perfect addition to smoothies, porridge bowls, juices and your favourite recipes. Just one serving is a big step towards your 50 g recommended daily protein intake. 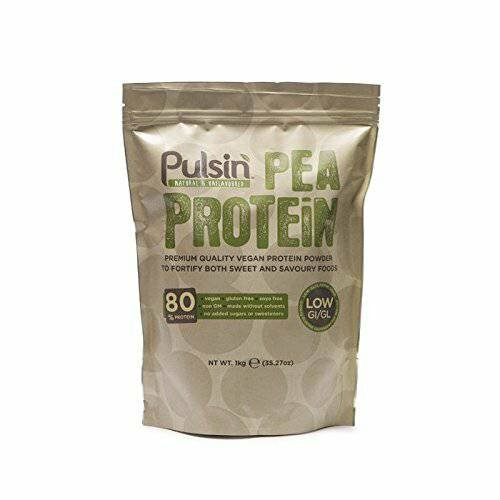 Pulsin Pea Protein Powder is low in carbs and fat as well as being a great source of essential amino acids and vitamins A, B6 and C.
It is soya free with no added sugars or sweeteners and non GM. Often recommended by nutritionists, Pea Protein powder is the ideal supplement for vegetarians, vegans, athletes or those on a weight-loss diet. Protein is essential for a healthy body. It's needed to build muscle and repair cells, boosts immunity and also helps balance blood sugar levels. Pulsin' protein powders are all GM and pesticide free, containing no nasty chemicals, only pure protein derived from plants. All Pulsin products are produced in Pulsins own factory in Gloucestershire UK which handles nuts and peanuts.